JNTUH B.Pharm 4-1 Sem (R15, R13, R09) Regular/Supply Examinations Results - Nov/Dec 2018 . Examinations Conducted In The Month Of Nov/Dec 2018 Has Been Announced By The JNTUH Hyderabad University. 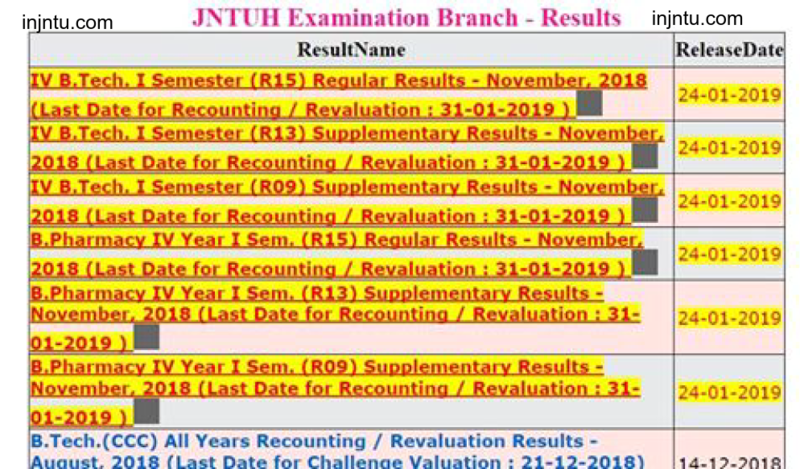 So, All The Students Seeking JNTUH B.Tech 4-1 Sem (R15,R13,R09) Regular/Supply Exam Results Nov/Dec 2018 Can Now Check It As It Has Been Made Available Today On By The JNTUH Hyderabad University.Below We Have Provided The Direct Links To Check JNTUH B.Pharm 4-1 Sem (R15, R13, R09) Regular/Supply Examinations Results - Nov/Dec 2018 - Info Provided By The JNTUH Hyderabad University. JNTU Hyderabad has successfully Conducted B.Pharm 4-1 semester Regular/Supplementary examinations in the month of November/December 2018. Huge Number of students are wrote these examinations. JNTUH conducted Regular/Supply Exams for R15, R13 and R09 Regulation students. Students those who are written these regular/Supply examinations, they are eagerly waiting for 4-1 results 2018. B.Pharm 4-1 Semester Regular/Supplementary Examinations - Nov/Dec 2018 Spot Valuation to commence from 6th December 2018. In each spell answer scripts of various Years/Semesters will be valuated. B.Pharmacy 4-1 Semester Regular/Supplementary Examinations - Nov/Dec 2018 Spot Valuation to commence from 6th December 2018. In each spell answer scripts of various Years/Semesters will be valuated. Click on the respective JNTUH 4-1 R15, R13, R09 Results links. So, Above You Can Get The Direct Links To Check JNTUH B.Pharm 4-1 Sem (R15, R13, R09) Regular/Supply Examinations Results - Nov/Dec 2018 Released By The JNTUH Hyderabad University. You Can Simply Bookmark This Page As Well In Order To Check All JNTUH B.Pharm 4-1 Sem (R15, R13, R09) Regular/Supply Examinations Results - Nov/Dec 2018 In The Future As Well. So Do Book Mark Our INJNTU.COM Page & Install Our Android App To Get All Notifications About Updates & Results Directly On Your Mobile Phone. Don’t Forget To Share This Result Of JNTUH B.Pharm 4-1 Sem (R15, R13, R09) Regular/Supply Examinations Results - Nov/Dec 2018. Among All Your Friends & Colleagues. Make Them Check Their JNTUH B.Pharm 4-1 Sem (R15, R13, R09) Regular/Supply Examinations Results - Nov/Dec 2018. Also Share This Info On Your Social Media Pages.